At this point we’d like to inform you again, that an update from IDERI note 2.x to 3.x requires new license keys! These keys have been sent to you by email. If you did not receive the keys be now, please contact us via sales@ideri.com. 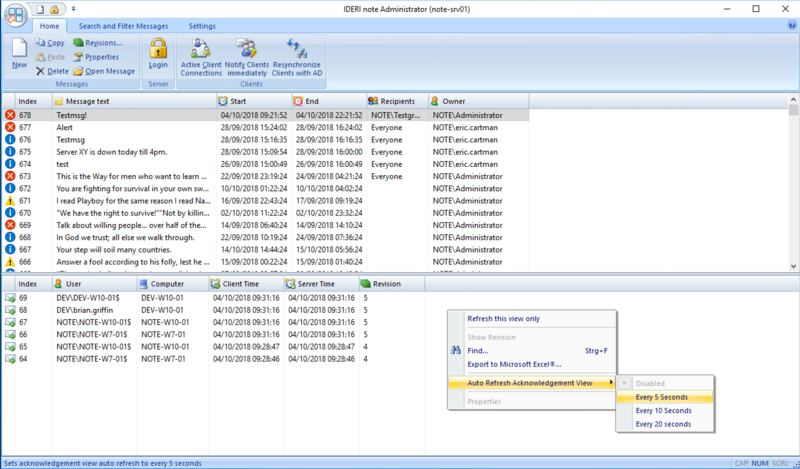 Customers without a valid maintenance contract can download the newest IDERI note Version of 2.x here. Although we’ve always been recommending our existing customers to update the IDERI note service first, it should be noted that from this release on it is absolutely necessary to update the IDERI note service first so that older IDERI note clients can still be used to receive messages. Messages can now also be displayed on the Windows Logonscreen even if no user is logged in. For this the IDERI note Administrator got some new options to create messages. Of course, these options can also be used via the IDERI note commandline tools. For this, the parameters “-l” (“show message on logon screen”) and “-lo” (“show on logon screen only”) have been added. This function is only available with IDERI professional mode. 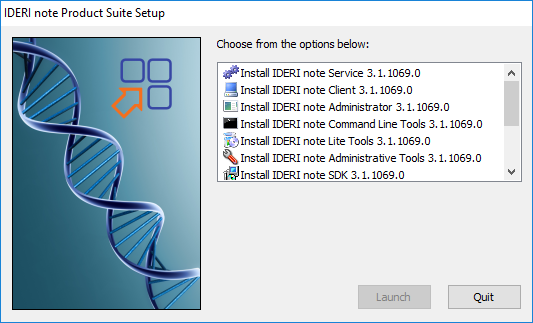 The IDERI note client needs to install the new service “inclsess”. For this, there is a new dialog “Logon Screen Client Start Options” during the setup of the client. If the checkbox is set, the service will be installed. On the server the function must be activated via the IDERI note server applet in the tab “Logon Screen Access”. 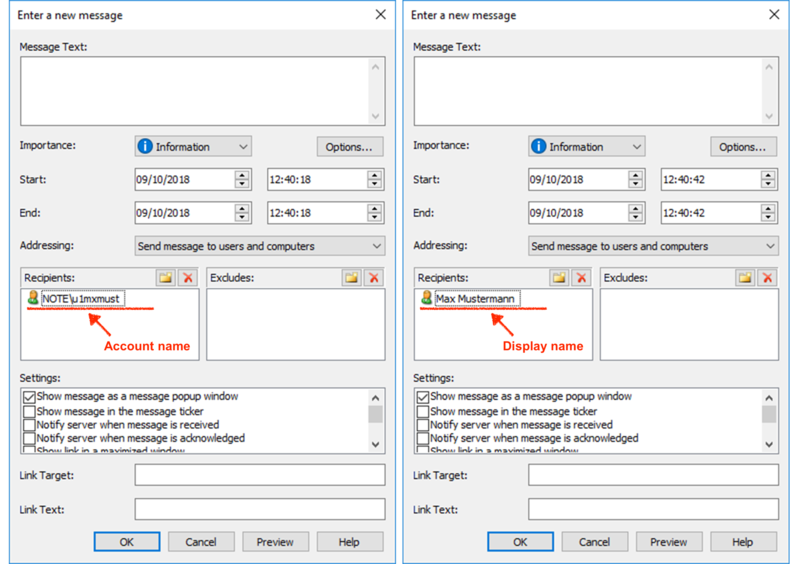 To display messages on the logon screen, the corresponding check mark must be set when creating messages. 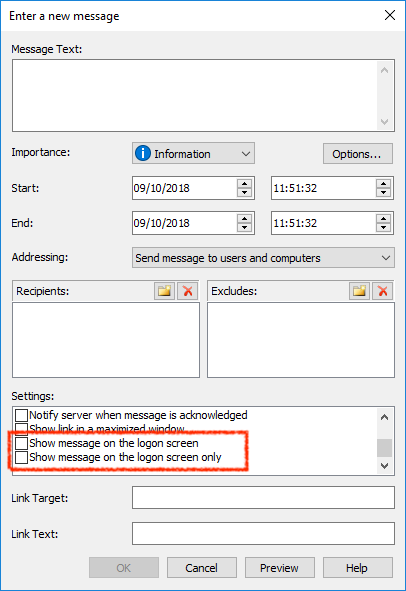 In the “Logon screen access” settings in the settings tab of IDERI note administrator you can then set permissions for AD objects on which computers the messages can be displayed or not. By right-clicking in the message or acknowledge view fields in the IDERI note Administrator, a new context menu entry can now be found with which an auto refesh for the view can be set. So you always have an up-to-date overview of the messages or acknowledgments. Often companies tend to use cryptic AD account names for the users login. If, on the other hand, the display names are maintained in the AD, you can now switch between Account Names and Display Names for a better overview and input in the IDERI note Administrator. It does not matter whether the account name or display name is specified as the recipient. 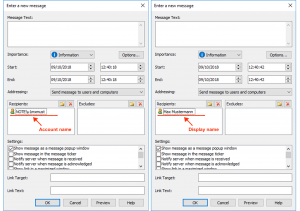 If new recipient groups were created in the AD, the users had to log out and sign in manually in order to synchronize their new membership and to be able to receive corresponding messages to the group. 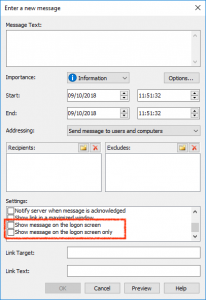 Starting with IDERI note version 3.1, it is now possible to bypass this procedure and notify the new group members without having to log out and log in. 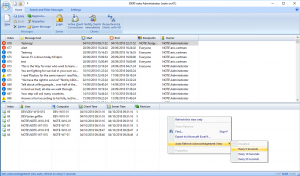 For this, the IDERI note administrator has been given another menu item called “Resynchronize Clients with AD”. 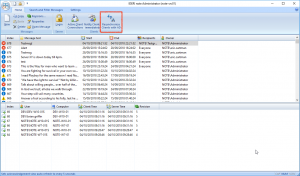 If new AD groups are created and members added to these or existing groups, this button in the IDERI note Administrator can then be used to use these groups directly as a new recipient. Members of the group receive the message immediately after the next polling interval of the IDERI note client is due. 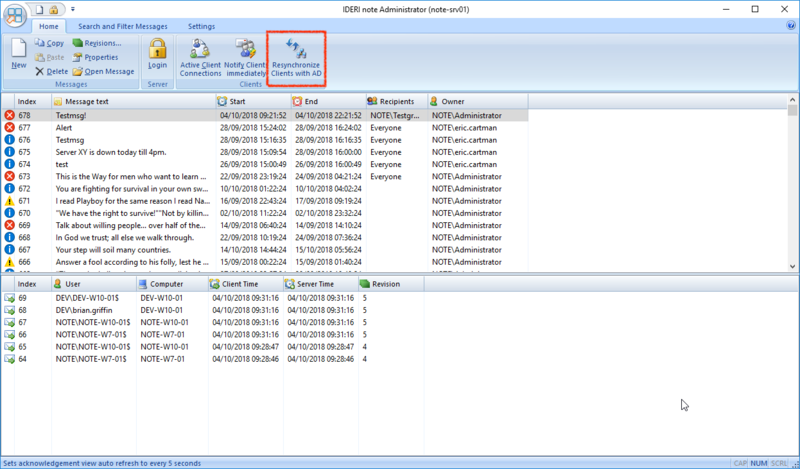 You can define who is allowed to perform this sync in the IDERI note Administrator via “Settings” – “AD Synchronization”, as this will increase the network load of the domain controller at short notice. With the introduction of IDERI note 3.0 and the addressing of computer objects, the number of client connections has doubled, resulting in increased load on the IDERI note server by the connected IDERI note clients. With version 3.1 the load could now be reduced again to the level prior to version 3.0. The IDERI note SDK has been adapted for the new features of 3.1 and has thus received a few more functions. This entry was posted in IDERI note en and tagged auto refresh, display names, Logon Screen, no user, release, resync ad by Sebastian Mann. Bookmark the permalink.